This is about Disha aged 5 year old, who is fighting with Brain tumour. 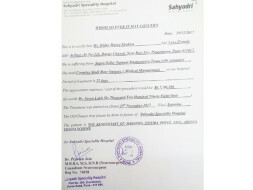 Disha is getting treatment in Sahyadri Speciality Hospital, Pune. Her family is not in a situation to afford such costliest treatment and at the same time can’t give up on Disha’s life; we need funds to save her life. The total cost of the treatment is around 7 lakh. Your contribution can give little Disha the treatment she deserves. Baby Disha passed away on 12th January 2018 at 1:30 am. 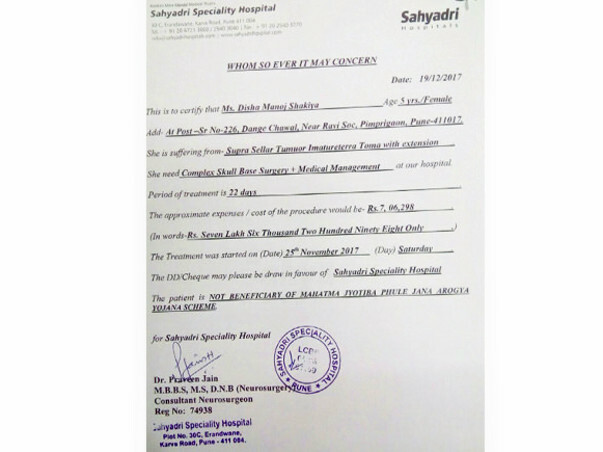 The operation was successful but sodium level in her body could not be controlled, which lead to problems in her heart and it stopped pumping. Doctors tried their best but could not save her. We are grateful to everyone who helped us in the time of need and supported us. 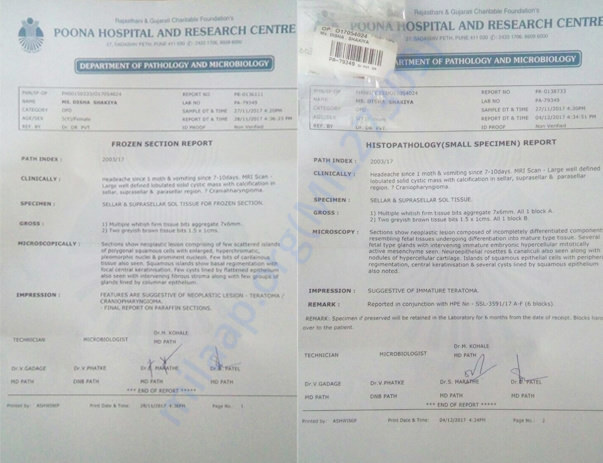 The funds have been transferred to pay the bills at the hospital. Here is an update on Disha. Thank you all for your support to date. Disha's operation was held on 27th November 2017 and she is still hospitalized. After a week of operation, she had a stoke because of that her left side immovable. Doctors are saying she will recover, but it's a lengthy process. Hope I will get the same support from all of you.